Information about the artists who created this stained glass window based on a Currier & Ives print is included on the jupg. 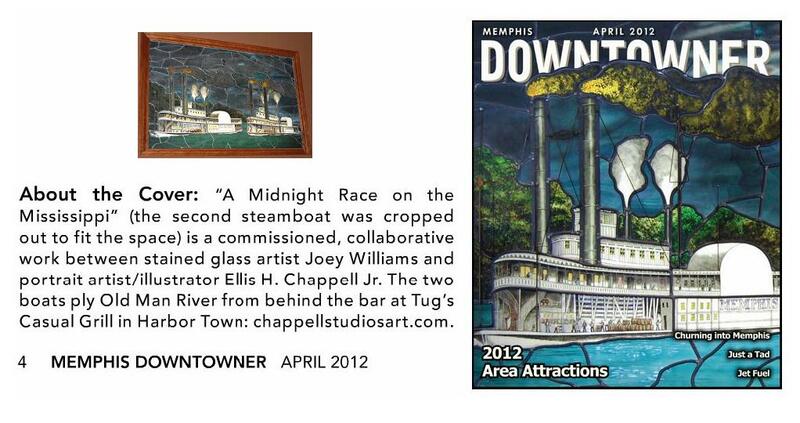 Found this recently online on the cover of "The Memphis Downtowner" tourist guide magazine for April 2012. The only sharp image of the entire window is the small thumbnail that in the upper left quadrant. Would be worth visiting Tug's Casual Grill in Harbor Town at Memphis just to see the window in person. Bet it is very impressive, hope that a larger image of the entire window turns up some day. 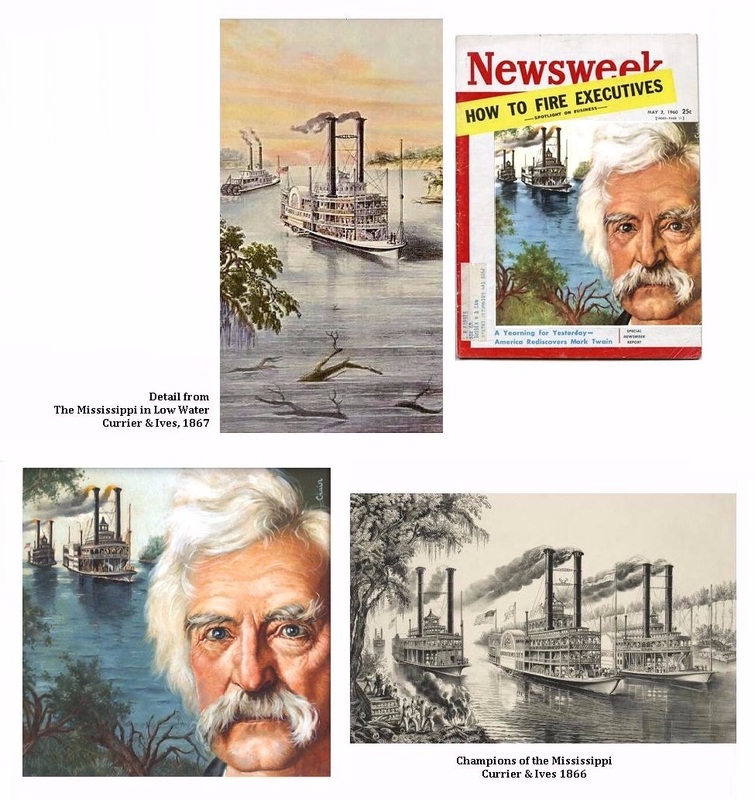 Mel Crair used Currier & Ives prints published after the Civil War as reference for the steamboats and Mississippi River for his Mark Twain portrait. See more about this magazine cover, click here. 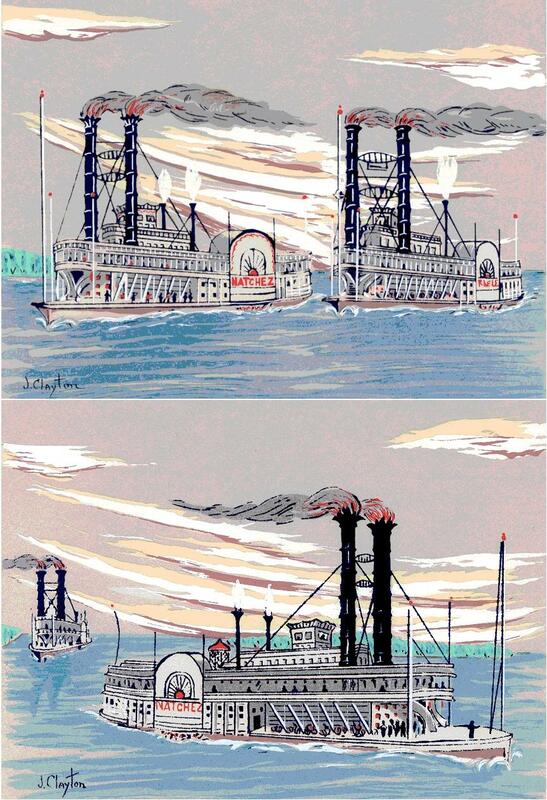 The Alton Lime Company (Alton, Illinois on the Mississippi) put out a series of fine reproductions of Currier & Ives steamboat lithographs. This one of the race of the R.E. Lee and Natchez was printed in 1955. I found it framed in the biggest antique store in Alton last October and had it restored to removed some "foxing" and other minor flaws. Am having it reframed to enhance its splendor. The artist Fanny Palmer (1812 - 1876) [full name Mrs. Frances Flora Bond Palmer] came to the U.S. from England during the 1840's. 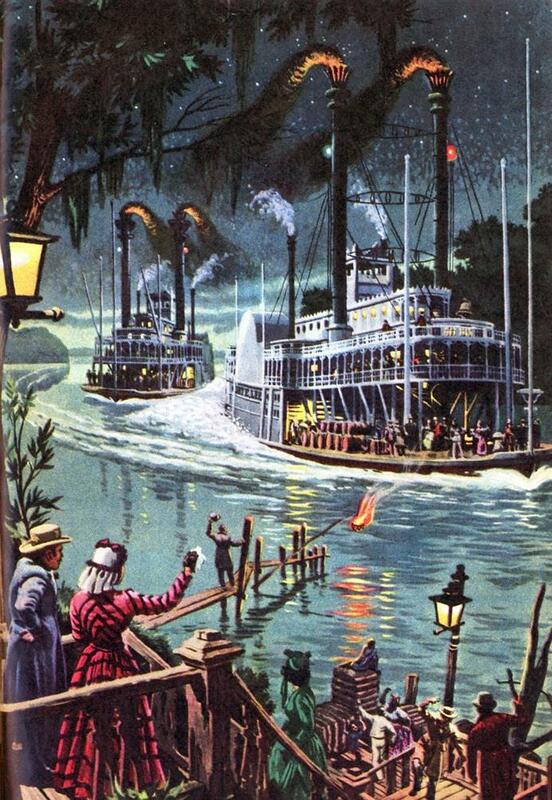 Ms. Palmer was a prolific scenic painter and Currier & Ives used many of her works as the basis for their prints including many steamboat scenes set along the Mississippi. Attached small file off the internet of Palmer's 1865 watercolor "Mississippi in Time of Peace" which is in the M. and M. Karolik Collection in the Museum of Fine Arts in Boston. 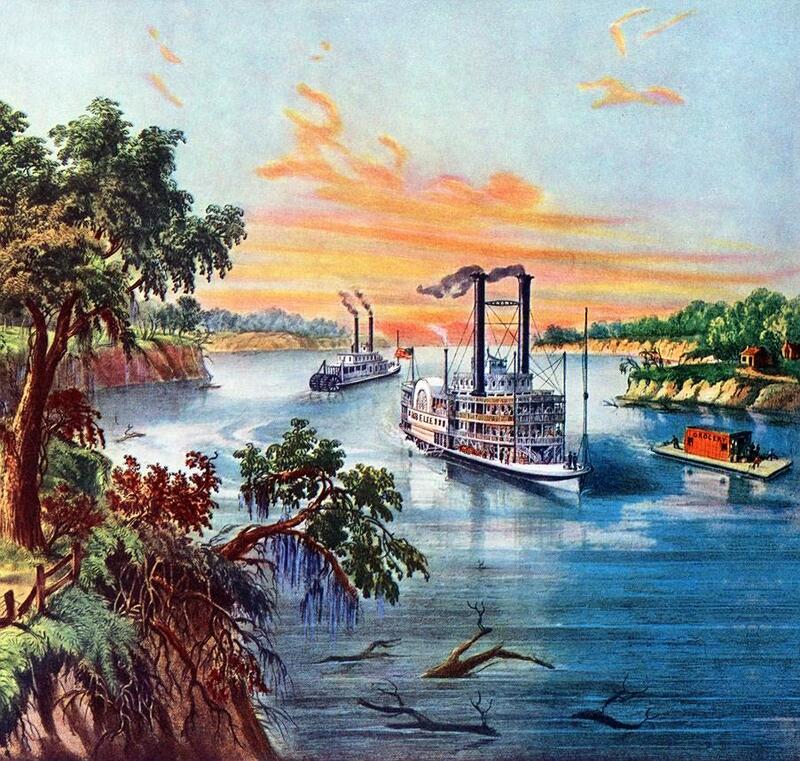 Below the painting is the pictorial portion of Mississippi Lime Company's 1982 reprint of Currier & Ives' 1885 edition of the print "Mississippi in Time of Peace." 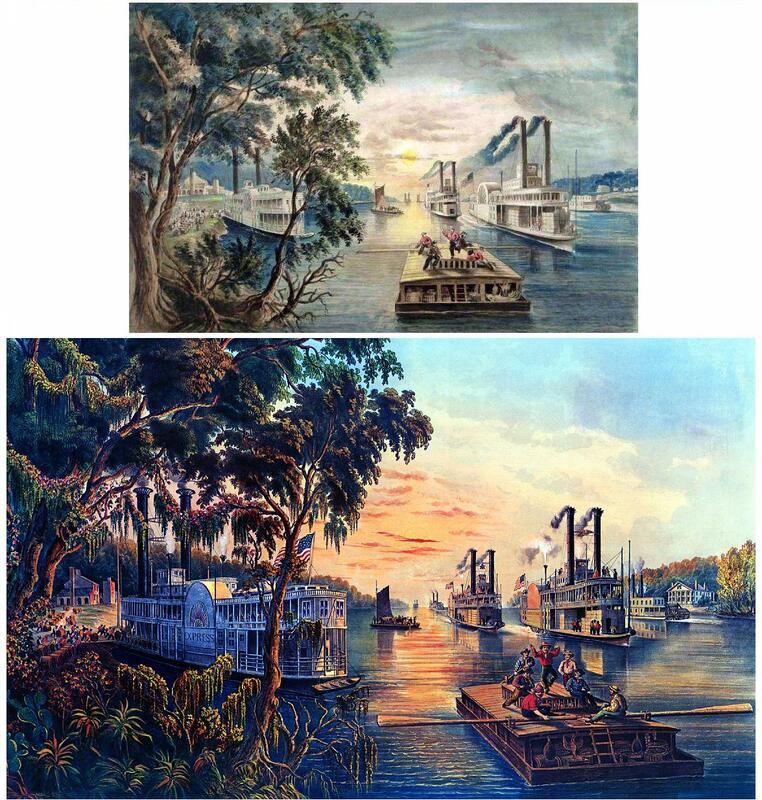 It is interesting to compare the two and see the changes made by the Currier & Ives lithographers in adapting Palmer's painting to their own print style, color and format. The most atmospheric of the Mississippi Lime Company reprints: Scene on the Lower Mississippi - Bound Down the River based on original art by George Fuller (American, 1822-1884) Originally printed by Endicott & Company The figure on top of the PRINCESS's pilot house appears to be a wraith-like woman in a bridal gown, guess she's a "Princess incarnate." The moonlit riverscape is nostalgic and evocative. 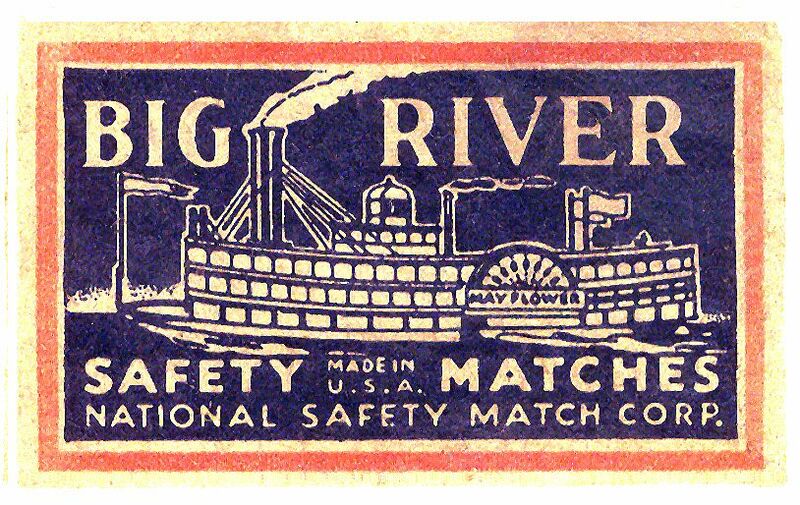 The commercial artist may have derived the steamboat MAYFLOWER from a Currier & Ives print. This uncredited illustration appears to have been influenced by the color lithographs of Currier & Ives. 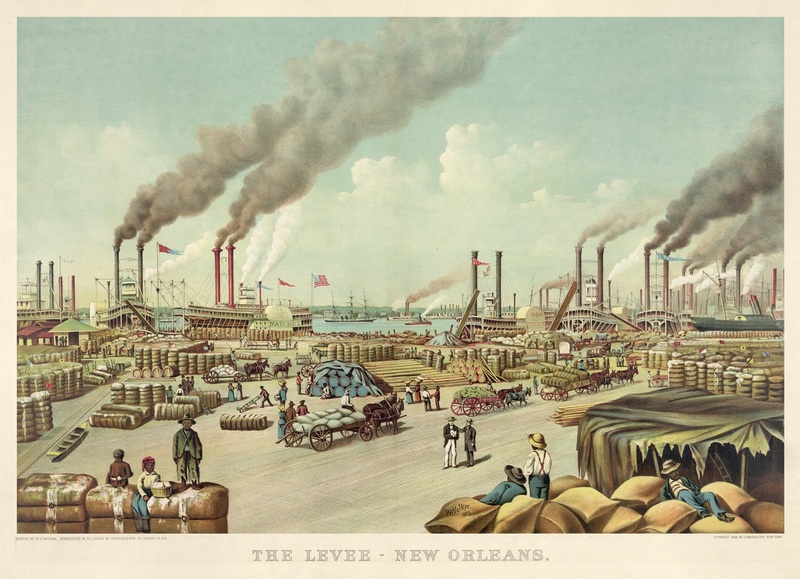 Detail from color lithograph of a scene on the Lower Mississippi entitled "SUNNY SOUTH"
This pair just in from New Orleans, circa mid 1900's, silk screened variations on Currier & Ives lithographs by J. Clayton. 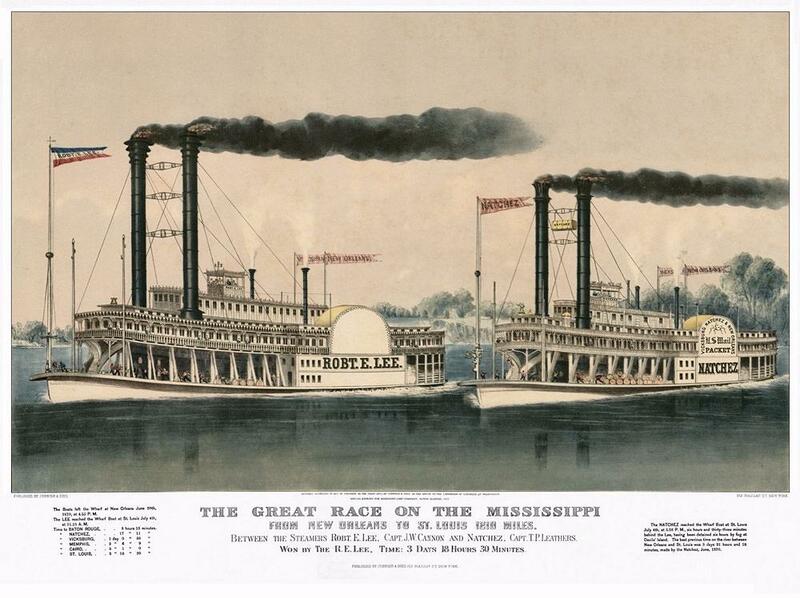 Based on the Great Race on the Mississippi and Rounding a Bend with names of boats changed or reversed. Attached is another detail (cropped differently and at a smaller size) of the color version of LOW WATER IN THE MISSISSIPPI for you to put in the SEVENTH position right after the grayscale version of LOW WATER. These two files are from the right two thirds of the image, in the left one third of the composition the artist Fanny Palmer depicted a plantation house on the bluff in the distance and below that in the foreground what had apparently been a slave's cabin before the Civil War ended 2 years earlier. In front of the cabin of what we assume now to be "freed slaves" Palmer drew 9 African American characters, 3 men, 2 women and 4 children. The characters are standing or seated and one of the seated man is playing a banjo in front of the cabin door on the far left while one adult male is dancing on the far right and 3 children are dancing in the center of the group of figures while a female toddler sits on the lap of a seated "Mammy" in the foreground. As racial stereotypes go this isn't the most reprehensible example but there is an element of grotesque caricature about the characters that made us decide to not include them in this gallery. 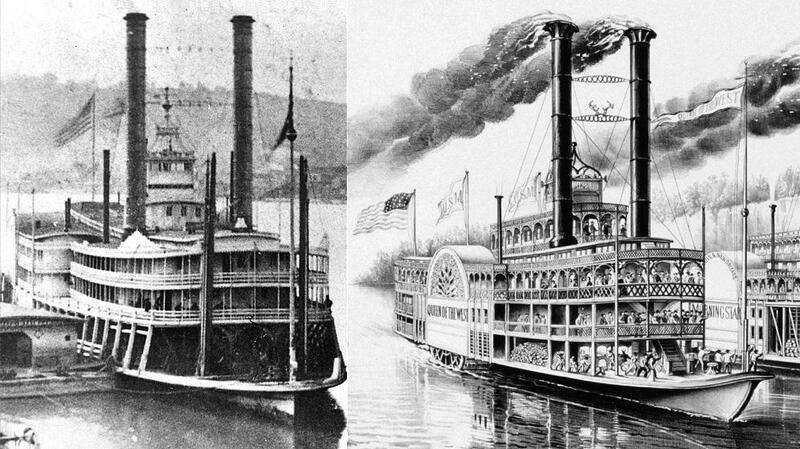 Both the AMERICA (photo on the left) 1867-68 and the QUEEN OF THE WEST 1854-63 had "'double cabins' with two tiers of stateroom decks" which was relatively rare in the Mississippi River valley, you'd see more double deckers on the Hudson River "walking beam" style boats Back East. The 1866 drawing by Fanny Palmer that Currier & Ives featured the QUEEN OF THE WEST in the lithograph "Champions of the Mississippi: 'A race for the Buckhorns'" which is interesting when it is compared to the photo of the AMERICA. 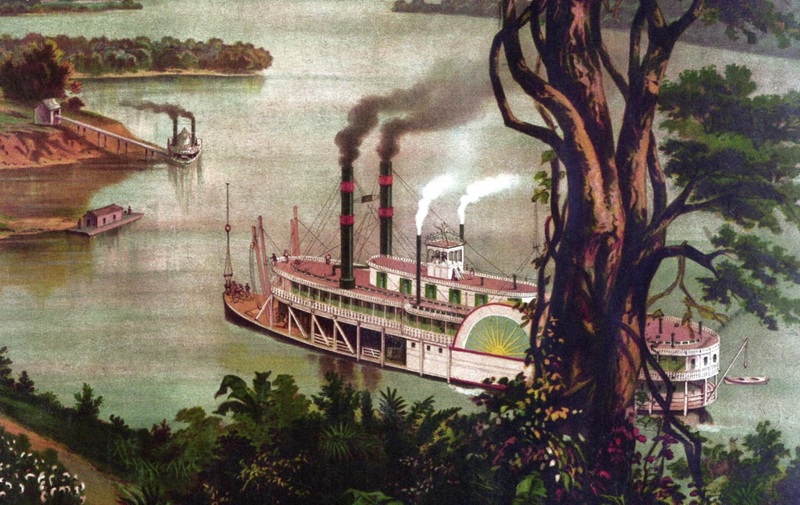 It's not known if Fanny Palmer had actually seen the QUEEN OF THE WEST since she may not have visited the Mississippi River until after the Civil War was over in 1865 and the QUEEN had been lost in battle in 1863 after she had been converted into a ram in 1862. There may have been a photo or a graphic by another artist Palmer could have used for reference. She also featured the QUEEN in "'Rounding a bend' on the Mississippi: the parting salute." Another double-decker was the MAYFLOWER by Currier & Ives. Early on, the QUEEN OF THE WEST was in the Cincinnati-New Orleans trade. At the outbreak of the Civil War, she was taken over by the U.S. Government with Captain Richard M. Wade in charge. She was converted to a ram and on April 25, 1862 she became one of Charles Ellet's fleet on the Ohio River with which he intended to clear the Mississippi River of all Confederate war craft. She was quite active in Battle of Memphis where she sank the GENERAL LOVELL and captured the GENERAL PRICE and entire crew. 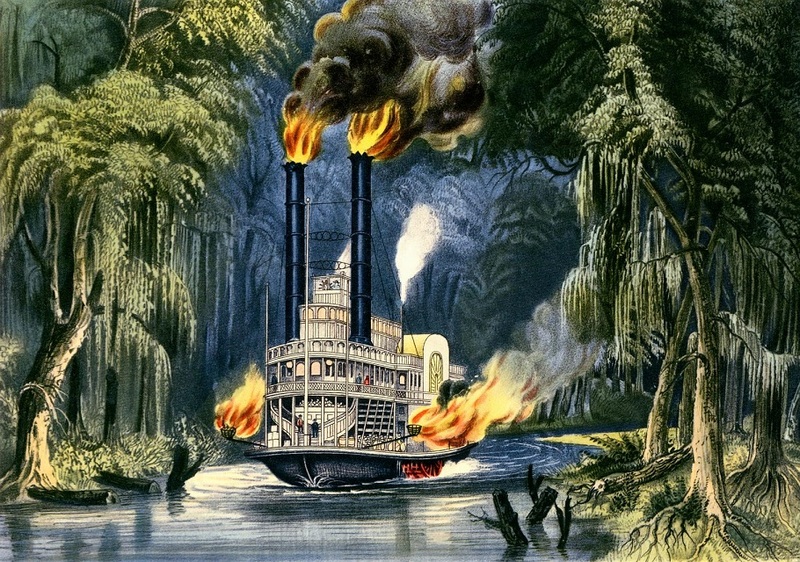 On February 11, 1863 she raided the lower Red River capturing A.W. Baker, Berwick Bay, Era No. 5 and an unidentified boat. On February 19, 1863, she was run aground and captured to become a Confederate gunboat. A month later, March 14, 1863, during the Battle of Grand Lake, she was struck with a percussion shell which set afire cotton bales piled aboard for protection. She then burned until her magazine exploded killing 26 hands.